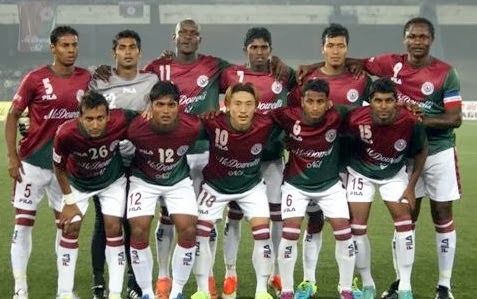 After the disappointment of Sunday’s loss to arch-rivals Kingfisher East Bengal, McDowell Mohun Bagan have another derby to look forward to in the Airtel I-League as they entertain Mohammedan Sporting in the round 11 fixture at the Salt Lake Stadium on Wednesday evening. The result against East Bengal ended Mohun Bagan’s four match unbeaten run and dropped them to the ninth place and they remain a point behind Mohammedan Sporting, who were held to a goalless draw by Churchill Brothers on Saturday. Despite the loss, Mohun Bagan coach Karim Bencherifa took plenty of positives from Sunday’s derby as his young defence were well organised and only beaten by a moment of magic from Lalrindika Ralte. Encouragingly skipper and talisman Odafa Okolie also completed ninety minutes for the first time in this Airtel I-League campaign after recovering from a long-term injury. Nigerian defender Echezona Aniyeche is back from suspension and thus the green-and-maroon brigade will have all four foreigners available for the first time this season. That aspect is keeping Bencherifa positive ahead of this clash against Mohammedan Sporting. “It is good to be playing so soon after a derby loss because it gives you a chance to bounce back quickly. I have a welcome headache while selecting the team now but we are expecting a tough match because Mohammedan Sporting are a very good side with quality Indian and foreign players,”the Moroccan was quoted as saying. After a difficult start to their first I-League campaign in four years, Mohammedan Sporting are finally showing that they belong at this level with just one defeat in their last six matches. The black and whites have significantly improved defensively as they have kept back-to-back clean sheets and coach Moshood Bola Abdulaziz now wants his side to be prolific upfront. “Our defending has been solid in the last two games but we must keep working hard. This game will be a new challenge so we must be up for it and hopefully will convert our chances,” Abdulaziz stated. Abdulaziz has a near full strength team to choose from with several ex-Mohun Bagan players like Tolgay Ozbey, Manish Maithani, Mehrajuddin Waddo and Ishfaq Ahmed at his disposal. Another Mohun Bagan old boy Syed Rahim Nabi though is not fully fit in the eyes of the Mohammedan Sporting coach and thus remains a doubt for this match. Both clubs have an illustrious history but this will only be the third meeting in the I-League and Mohun Bagan lead the head-to-head record with a win and a draw. However with just two places separating them in the current table, one can only expect a tight encounter.